4 Then the Lord said to him, “Reach out your hand and take it by the tail.” So Moses reached out and took hold of the snake and it turned back into a staff in his hand. This scene occurs a moment after the previous scene (Exodus 04 – Burning Bush – Scene 04 – Staff) in the late afternoon. The sun lights the scene from the left. Notice there is an additional yellow glow on the ground & the left side of the figure of Moses, from the burning bush off to the left. Three of his goats in the middle distance. I have created two versions of this scene. In this one I have shown the snake smaller & Moses as a larger figure than in the previous version (Exodus 04 – Burning Bush – Scene 04 – Staff (Large version)). This small snake version was the one I completed second, specifically designed for use by a US sports ministry, catering for small children, aged 5-6 years, hence my decision to “tone down” the snake, so as not to frighten the kids! I have also reversed the snake, so that it is looking away from Moses, & hence appears to be less threatening. I used some photo’ reference from the internet to help me design the snake in this scene. I decided to make the colour of the snake fiery yellows & reds, since that way it’s colouration links in with the flames of the burning bush. I remembered I’d seen a fiery looking snake, which turned out to be a rare, yellow/orange version of the Bush viper (Atheris squamigera) . I am very pleased with the way the snake came out from a design point of view. It took several hours to colour up the many scales of the snake, but it was worth it! 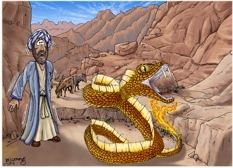 There are two recorded incidents of Moses’ staff becoming a snake: the first is here in Exodus 04:1-3 & a little later in the presence of the Egyptian king (Pharaoh) & his magicians or sorcerers, in Exodus 07:8-12.
a venomous viper species endemic to west and central Africa. Common names: Green bush viper, variable bush viper, leaf viper, common bush viper, bush viper, tree viper. No subspecies are currently recognized. It grows to an average total length (body + tail) of 46–60 cm (about 18-24 in), with a maximum total length that sometimes exceeds 78 cm (about 31 in). Females are usually larger than males. The head is broad and flat, distinct from the neck. The mouth has a very large gape. The head is thickly covered with keeled, imbricate scales. The coloration is the same in some populations, but variable in others. The dorsal color varies from sage green or light green to green, dark green, bluish, olive or dark olive brown. Rare specimens may be found that are yellow, reddish or slate gray. The scales have light-colored keels and sometimes yellow tips that form a series of 30 or more light crossbands or chevrons. Bites from this particular species have resulted in at least one report of severe haematological complications as well as two deaths. All artwork, pictures and contents Copyright © 2014 - 2019 Martin Young.